The third monument of the season is over us, the famous Paris-Roubaix. This race sets a dot to the hardest week of the whole calendar, with de Ronde at the beginning of the week. The two races are almost equal in terms of length, around 260 km each. So, what is the difference? 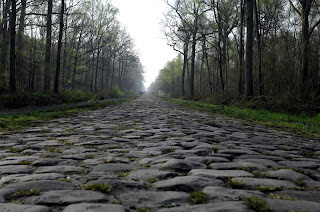 The cobbles in Paris-Roubaix are totally different than those at Flanders. The cobbles in Flanders are smaller and more squared, they are also located on a smooth surface with some sort of systematic plan behind them. They rattle your handlebars pretty bad still, coming into them at 60 km/h. The main difference though, is the space between the cobbles. While the cobbles in Flanders are pretty neat lined up, the cobbles in Paris-Roubaix seems like something kicked randomly out of the back of a truck (something they are). The distance between the cobbles combined the the sheer size of them, makes the difference. 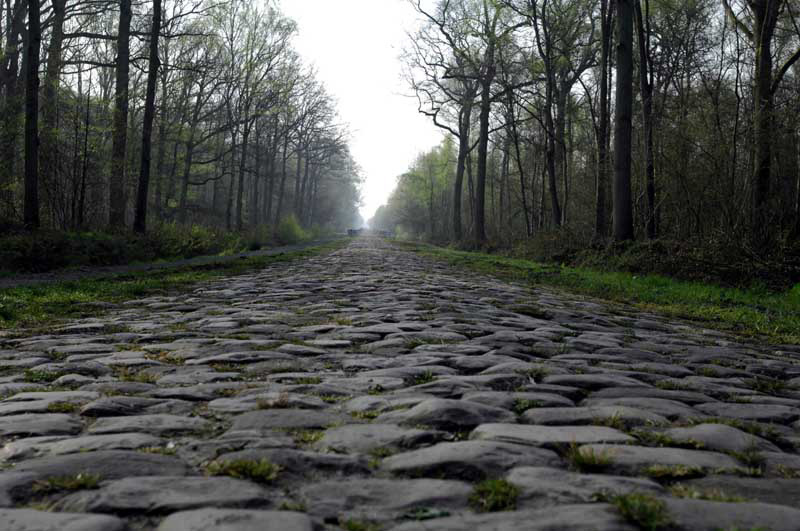 That, and the fact that this year's edition of Paris-Roubaix gives you total 51,5km of cobbled sections. Although the cobbles hit you after a solid 97,5km of cycling, they don't give you any chance of recuperating once they start. There are about five to six stones per meter, the vibrations shoots right through the legs, spine, arms, neck and shoulders so hard and so fast that blood does not circulate as freely as before, adding to the fatigue. The cobbles are classified into based on difficulty by the race director. Two of the most famous cobbled sections, Trouée d'Arenberg and le Carrefour de l'Arbre, are both ranked highest difficulty. It's not easy sitting on someone's wheel through the cobbled sections, at least not over those with the highest difficulty. You have to balance eyesight to drag and if there is one place you really need to watch your step, it is over these cobbles. 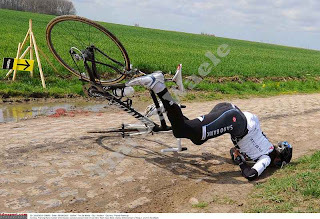 If someone asked me to describe Paris-Roubaix with one word it would be brutal. As you all know, the positioning before the cobbles is crucial, making the pace incredible fast the last 10km or so approaching the cobbles. Every captain will want to be at the front so the race is on with swearing, snorting and elbows several kilometres prior to the cobbles. Five stars: Tom Boonen, Pippo and Ballan - all performed very well last week at Flanders with Tommeke as the obvious fav. However, Paris-Roubaix doesn't care for favs so anything can happen. Four stars: EBH, Thor Hushovd - Edvald Boasson Hagen performed well at Flanders and is even better at the flat cobbled race. Hushovd's has been struggling with disease but says his form is coming. Three stars: Paolini, Sep Vanmarcke - Paolini is a strong rider in the classics, often not labeled a fav but has performed well lately. Sep is Garmin's hope, one of the few who has out sprinted Boonen (something Boonen is very aware of me thinks) and he has several good placings in semi-classics, making him a clear outsider to this year's Paris-Roubaix. Normally, Cancellara, Leukemans, Breschel and Sagan would have been additional contenders but they are all out. One of the season's absolute highlights is over us, several top contenders is out but who cares. This is the most brutal race of the season, totally unforgiving. And, one factor I haven't mentioned yet is the weather which can turn this race upside down. I say; bring it on.